Experience giant-sized physique gains with a new twist on a classic training principle. You can follow Jim or build your own workouts with this template! There are plenty of great ways that lifters combine movements in the quest to build lean, muscular physiques. You can do antagonist supersets, compound sets, circuits, complexes—you name it. But the least appreciated, and the most overlooked, of these approaches is without a doubt the giant set. This technique, made popular by the "Master Blaster" Joe Weider through his famed Weider Principles over a half-century ago, is so seldom utilized that I have to clarify exactly what giant sets are nearly every time I bring them up to people. But don't worry, I'm going to cover all the bases in this article and show you exactly how to put giant sets into action in your training program for giant gains in muscular size and strength, as well as maximum fat-burning. I call this my Giant Program, and it's produced great gains for JimStoppani.com members ever since I first introduced it two years ago, in April 2015. But I have a new version here just for you, which you can follow me doing daily on Facebook over the next week, or use to create your own workouts. Giant sets are a high-intensity training technique in which you do four or more exercises for one muscle group consecutively without taking any formal rest between exercises. It's a similar concept as the basic superset, only with at least two more exercises added on. I know what you're thinking: "Isn't this just a circuit?" No. The key difference with giant sets is that all exercises are for the same body part, whereas a circuit typically hits a different muscle group with every move. So we're talking four chest exercises, four back exercises, or four leg exercises, performed back-to-back with virtually no rest—though you will take a 1-3-minute rest after each giant set to recover. Sounds exhausting, right? That's exactly the point! Traditionally, bodybuilders would use giant sets to bring up a lagging body part, such as underdeveloped quads, biceps that are dwarfed by overpowering triceps, or a weak chest that lacks fullness. But giant sets offer a number of other attractive benefits as well. Giant sets aren't merely an intensity booster for sparking new growth in a particular muscle group, they're also a great time saver and fat-burning tool. Think about it: When using straight sets and doing 4 sets of four exercises for a given muscle group, that's 16 sets total and 16 separate rest periods. Change those straight sets to giant sets, and you cut that down to four rest periods. This is likely to save you, at the very least, 12 minutes just for that one muscle group. If you've got a busy lifestyle and a demanding career, that's valuable time you're saving. Where results are concerned, time is intensity. The less time it takes you to do the same amount of sets, the higher the intensity. The higher the intensity, the more dramatic the results in muscle size, strength, and definition. And these are just the benefits of standard giant sets. My Giant Program takes the technique to a whole other level by incorporating periodization and pre-exhaust. These aren't your grandpa's giant sets! My Giant Program as it reads on JimStoppani.com is a three-day split: chest, shoulders, and triceps on day one; back, biceps, forearms, and abs on day two; and legs, traps, and calves on day three. But my latest version, which I'll be covering for the next week on my Facebook page with a week's worth of sample workouts, will be nothing but full-body routines. I've been harping on this a lot lately, but I don't mind repeating myself: I'm a huge proponent of full-body workouts! Why? For one, you can train that way nearly every day, if you're so inclined. For another, they've been shown to burn more body fat than body-part split routines. Just about every workout I do these days hits all major muscle groups, and I've been very happy with the results. I'm building muscle while staying as lean as ever! But when you're combining full-body workouts with giant sets, you've got to do it right. In my JimStoppani.com version of the Giant Program, I recommended 2-3 giant sets for each muscle group—which made sense for a body-part split. But in my "2.0" Bodybuilding.com version, you'll only be doing one giant set per muscle group. That's one set of each of the four exercises. Feel free to occasionally do two on larger muscle groups if you have the time, but it's not necessary. Because you're training every muscle group in every workout, you only have so much time. Plus, because you're training nearly every day, you'll want to keep volume in check to allow for adequate recovery. These full-body giant-set workouts can be performed anywhere from 3-7 days per week. If you do train seven days in a row with the program, as I plan to, just make sure you take 1-2 days of rest before starting into your next week of training. If you're following along with my personal schedule, we will get one day off after seven consecutive days of giant-set training. My Giant Program 2.0 alternates between a few different exercise sequences. In one workout, you'll do two multijoint (aka compound) exercises first, followed by two single-joint moves. This will allow you to use the heaviest weight possible on the multijoint exercises to maximize the mechanical overload placed on the muscles. This is the conventional way to do giant sets—big moves first and finish with isolation exercises. Conventional is great, but results are maximized only when you combine it intelligently with the unconventional. So in some other workouts in this program I'll flip the script and have you perform two single-joint exercises first, then two multijoint moves. This is a technique I employ often in my programs, called pre-exhaustion, or "pre-exhaust" for short. The rationale behind pre-exhaustion is that single-joint exercises isolate a target muscle group more so than multijoint exercises—which is why single-joint moves are also called "isolation" exercises. But for the purposes of this program, I'm relying on even simpler descriptors: "heavy" and "light." For a given muscle group (in this case the chest), the conventional exercise order of heaviest move to lightest provides the benefit of allowing you to use the most weight possible when the target muscle is fresh. With pre-exhaust, the benefit lies in full exhaustion by way of isolation using a lighter weight. Both practices are great for stimulating muscle growth, just in different ways, which is why both are utilized in the Giant Program. Do it My Way or Your Way, But Do It! If all these explanations are starting to overwhelm you, don't worry. The Giant Program workouts are very straightforward and easy to follow—though also very challenging! To make it as simple as possible for you to start doing the full-body Giant Program workouts on your own immediately, I'll be posting a week's worth of routines that I'm doing myself on my personal Facebook page. By getting an inside look at how I'm training, you can see exactly what exercises I'm selecting for Giant Program workouts and what the sets, reps, and rest periods are. That said, I also encourage you to make the program your own. I realize that grouping four exercises one after another with no rest presents some practical issues when training in a busy gym. This is the standard knock against giant sets—and a valid one!—but in this program, it can also be used to your advantage. If you find that a piece of equipment you want to use is occupied, use comparable exercises to make the routines more feasible—and to give your muscles novel stimulus. Are all the pressing stations taken? Then start with machine flyes and make this a pre-exhaust day. 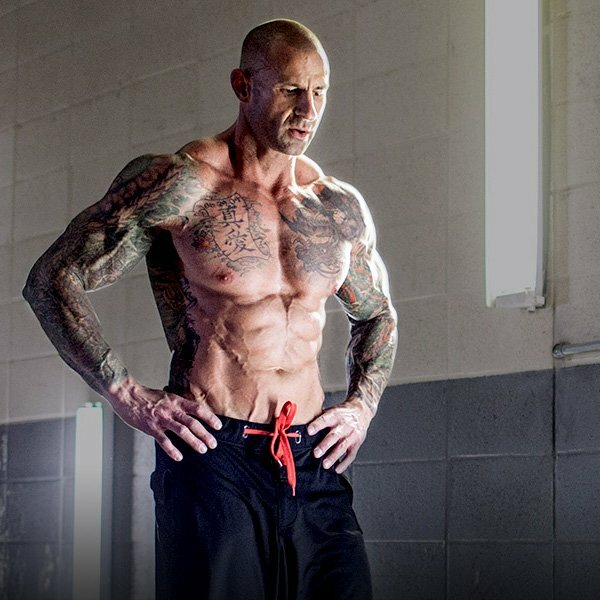 The JimStoppani.com version of the Giant Program utilizes linear periodization with microcycles. Each week, the weight gets heavier and the reps get lower. But leave it to me to complicate it for even better results. When crafting your workouts, there are endless ways you could sequence muscle groups, but not all of them work for giant sets. Hitting shoulders right after chest and back, for example, may not provide enough rest for the delts. Here are examples of heavy and light moves for each of those. Feel free to use others based on the equipment you have access to. Enough talking; time to get to work. This is a template you can squeeze value out of for years! Enjoy all the gains that this lethal combination of giant sets, pre-exhaust, full-body training, and varying rep ranges has to offer.